THE AUSTRIAN: Among those of us who are very laissez-faire, Europe’s liberal nineteenth century seems like ancient history, and people like Richard Cobden seem to be incredibly far from what is now the mainstream. And yet, leftists seem to believe that “neoliberalism” (i.e., the ideology of “limited government”) is making gains everywhere. Can you put things into perspective for us? Historically speaking, how much cache does liberalism have right now? RALPH RAICO: Yes, today Cobden is far from the mainstream, which is a pity. He was the best classical liberal (or libertarian) theorist of international relations who ever lived, and his incisive critiques of the greatest empire of his day, Britain’s, are totally pertinent to the greatest empire of our own time, America’s. Leftists generally have been mistaken regarding our philosophy. 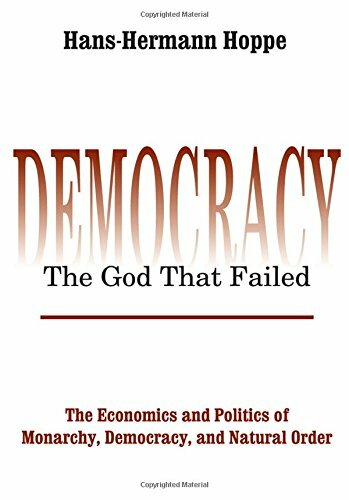 What is called “neoliberalism” is in reality simply a center-right point of view, far from what authentic liberalism meant historically — so-called neoliberals include Democracy u2013 The Go... Hans-Hermann Hoppe Best Price: $31.85 Buy New $39.75 (as of 04:40 EDT - Details) the Christian Democrats in Germany and Italy, for instance, and the Conservatives in Britain. The true anti-state position is represented by a number of relatively small groups, most of them associated with or inspired by the Mises Institute itself. TA: In your lectures, you have noted that it was really the liberals who came up with “class analysis” which Marx later incorporated into his own work. What can we learn from this today? RR: Liberal class analysis predated the Marxist version and, in fact, inspired it, as Marx and Engels freely admitted. It originated in France in the early nineteenth century, with the Industrialist school, but it permeates the whole history of liberalism and libertarianism, from Cobden and John Bright to Herbert Spencer, the great Gustave de Molinari, in America Albert Jay Nock and Frank Chodorov, and to the present day. It was central to the political outlook of Murray Rothbard. The liberal class analysis holds that history is indeed a struggle between two classes. TA: Much of Europe seems excited about belligerence toward Russia, combined with periodic attacks on African and Middle Eastern countries. Does the ghost of colonialism and nationalism still live among Europeans? Perhaps in some sort of mutated form? RR: Mass democracy, as its nineteenth-century liberal opponents foretold, inevitably devolves into a contest of contending forces, motivated by corrupt self-interest, either directly financial or ideological. (A superb dissection of this phenomenon, incidentally, is provided by my friend, Hans-Hermann Hoppe, in his Democracy: The God that Failed.) “Democracy” has become a concept weaponized by the US government in its global power struggles. Russia provides an excellent example. Vladimir Putin, for all his faults, has assisted the cause of peace and freedom on a number of fronts. Let’s not forget that he granted asylum to the heroic whistleblower Edward Snowden, who, if the US and its European lapdogs had had their way, would have been condemned to torture and probably found hanged in his cell. Putin has successfully resisted American attempts, under the pretext of spreading democracy, to destabilize his country and subordinate it to US world hegemony, and he has blocked such attempts elsewhere, as in Syria (so far). The old colonialism is still at work today, obviously so in the Middle East. Here it isn’t the European powers that are primarily involved, but the sole would-be hegemon, the United States. The great majority of Americans have little interest in and virtually no knowledge of foreign affairs. So, again, control falls into the hands of those who have a very definite interest and know exactly what they want. The classical period of imperialism extended from the last decades of the nineteenth century to 1914. Historians have long since amply demonstrated the role of specific economic players in the home countries, as well as the role of the driving ideology, basically white supremacy. In the present time in the Middle East, the parts played by financial interests, the great oil companies, for example, and by supremacist ethnic groups are also clear. By a great irony, today colonialism in the narrow sense — the migration of populations to foreign lands — is the reverse of what occurred in the past. As the headlines show us daily, it is the formerly subject peoples, in the north- and sub-Saharan Africa, as well as the Middle East, vast hordes of blacks and Arabs, who are migrating to, really, invading Europe. A Camp of the Saints situation is developing which, if not sternly checked, will result in the death of the old continent, the mother of modern civilization. TA: Among liberals, the idea of “the small policy” once held sway, albeit not without enduring extensive criticism from those who held it to be too prosaic. It seems that militaristic rhetoric has won out, but at the same time, there has not been a war among major powers for seventy years. Is it possible that economics has precluded war for many, even if few are willing to say so? RR: Militaristic rhetoric does seem to have won out. Many millions who couldn’t locate Iraq or Afghanistan on a map rush to support American aggression against those unfortunate countries. While there is extensive warfare in many places around the globe it’s true that war between the major powers, principally the US and Russia, has been avoided. It seems to me, though, that the basic reason is that such a war, between two nuclear-armed nations, would mean the end of all ordered society. The ruling elites on both sides realize this and have, thankfully, refrained from blowing up the world. What would happen if Israel ever decides to exercise the Samson Option, however, is unclear but very troubling. TA: It is perhaps an irony that liberalism gained strength alongside a strengthening of support for the nation-state as an ideal. This was when politicians like Bismarck succeeded in consolidating state power. What do you see as the trend in this respect here and now in the twenty-first century? As an aspect of their confusion, most of the liberals joined Bismarck in his Kulturkampf or campaign against the Catholic Church. They did not grasp that such institutions as the Christian churches, made appropriately voluntary, could be powerful allies in the struggle for a free society.